A new year promises a new beginning. Just the thought makes me smile because, y’all, I need one. I love being with my kids every day, teaching them and learning with them, but I have, to be honest, and say that we didn’t exactly finish last year on a high homeschool note. If Christmas holidays were the finish line, we barely limped across it. There were several reasons that had nothing to do with how far behind my daughter had gotten in math and everything to do with learning to live and love in difficult situations. It was hard, and it was tiring. I wanted to throw in the towel every bit as much as my children did. So we stopped. 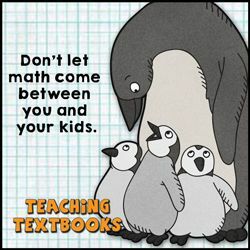 I didn’t badger my oldest to finish her math lessons. I didn’t even look to see if my son had covered all the lessons in his reading book. We just stopped. We baked cookies, played games, and read books just because we wanted to. More importantly, we enjoyed being together. We relaxed. We caught up on the laundry and cleaned the house. It was like a Christmas miracle because practically no one complained. Of course, taking a break doesn’t equal quitting so as the new year begins so do we, and to be honest, I am looking forward to a fresh start this January. I’ve thought about the reasons we were struggling, and I’ve made a commitment to do things a little differently this year. 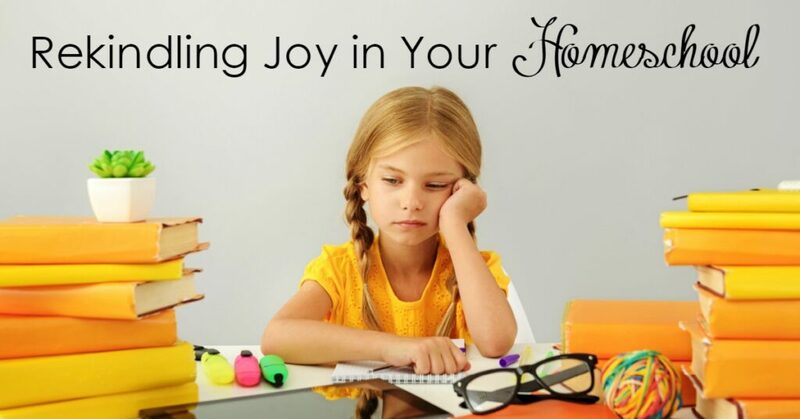 Because we need joy in our hearts and in our homeschool. Maybe you do, too? It is so easy to get wrapped up in the day-to-day getting things done that we lose sight of why we’re doing them in the first place. We feel burdened rather than blessed, and we pass that on to the little people all around us because whether we realize it or not, we set the tone for our homeschools. So, how can we set a better one? How can we rekindle the joy in our homeschools? In our hearts? Not just because it’s a new year, but because it’s a new day. Every day. When I taught high school English, I always told my students to leave last period at the door. I promised to remember that I didn’t know what had just happened in the hallway, and I wanted them to remember that they weren’t the first kids I’d dealt with that day. We all needed to start each class period with a fresh attitude and an open mind. The same is true whether I teach teenagers or toddlers. I can’t teach them well today if I am fixated on yesterday’s failures. One day at a time is the only way to do this thing, you know? He has new mercy for us every morning. We just have to seek it, to seek him. It is so easy to start the day in a rush and just keep going from there, but the truth is we need, to begin with blessing not start with stress. We have to be intentional about this, and the best way to do so is God’s word. Read it and pray. It can take less than five minutes but will have a lasting impact on your day and on your children. This year, my kids and I will focus on a different verse each week in addition to the verses we learn during our Bible lessons. The theme for these verses will be joy, rejoicing. I hope that beginning each morning by meditating on the reasons we have to rejoice and the joy that Christ gives will influence our attitudes throughout the day. I am not by nature a very structured person. I married an engineer for that. Still, our homeschool needs structure and routine. This past fall we didn’t have enough of it, and that is an area I will work to improve. Why? Because flying by the seat of my pants is a sure-fire way to stifle the joy in our homeschool. It is stressful to rush from one thing to the next, playing catch up all the time. My kids feel the same way even if they can’t articulate it. They need to know what to expect each day, as well as what will be expected of them. When we miss math one day, it is much easier for them to expect to get out of doing it the next. One of my goals for implementing structure, in addition to starting the day with scripture, is to do the hard things first. Math in the morning is one of the new rules. Get it done and move on. My kids will behave better without the weight of the things they dread hanging over them all day. They will also have fresh minds and right attitudes, which are of utmost importance when they have to tackle tough tasks. We couldn’t control the things that kept interrupting our schedule in the fall. Broken bones and doctor visits will do that to you, but there are things in our schedule that are not essential. It might be time to tone it down and say no to activities, even educational ones. We can’t be everywhere and do everything, and my kids get really tired of trying. So do I. When it comes to homeschooling or motherhood or life for that matter, knowing what’s important is central to achieving success. If my goal is simply to teach my kids to read and write and reason, that purpose will help me prioritize. Of course, my goals for homeschooling are more about who my children are than simply what they learn. Remembering that from day to day helps me have joy in the small things, in the things I often overlook when I am more worried about checking items off a list. Are my children learning to show compassion? Are we learning to be gracious to others? To each other? Yours, too! Learning is fun. We tend to forget that when time gets tight, don’t we? We start worrying about getting through the curriculum and stop digging deeper into the things that inspire our kids. Don’t fall into that trap! Don’t let your schedule (as important as it is) dictate your schooling. If you have a child who is fascinated by fossils, foster that fascination. Is there an art lover in your family? Make time to let her creativity flow freely. Both of these examples offer endless opportunities to use a child interests to teach multiple subjects. Anatomy, physiology, math, literature – just to name a few. Make the most of the things in which your kids are most interested. Homeschooling is not just about parents teaching their children. It’s about families learning together, exploring together. In your backyard or around the world. And it isn’t just about learning; it’s about living. Really, homeschooling is about learning to live. It’s about discipleship. After all, that’s the greatest goal, right? 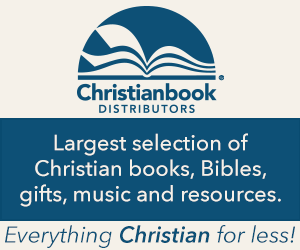 I want to learn to follow Christ more and more, even as I try to teach my kids to do the same. As we do, as we follow him, our joy grows. He makes our joy complete, in our hearts and in our homeschools. 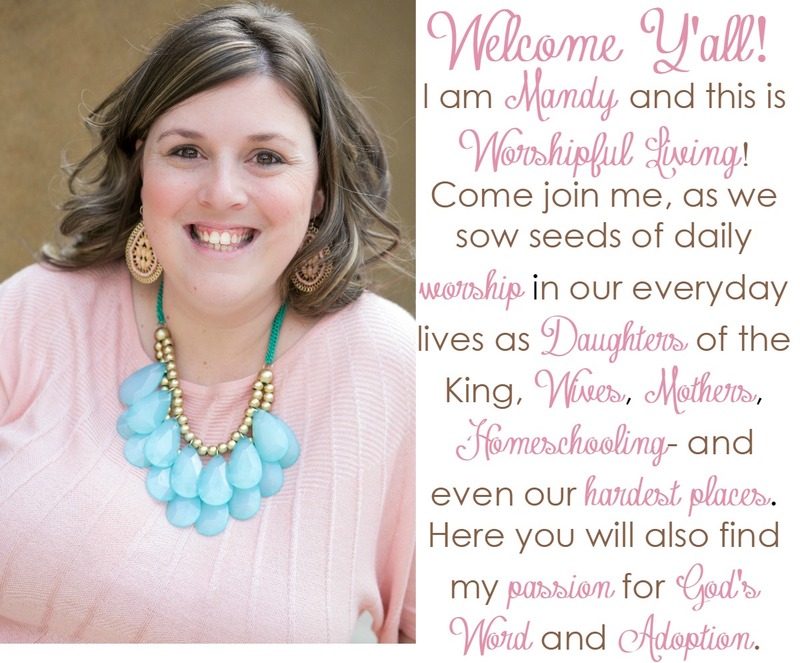 By subscribing below, you will get this amazing printable, and be subscribing to both Worshipful Living and Butterfly Beginnings! Charlie White is the homeschooling mother of four behind the blog MississippiMom.com, where she writes about faith and family while making a home in the Hospitality State.